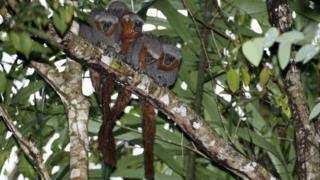 Researchers have discovered 381 new species during a two-year study in the Amazon region. The report by the WWF conservation body and Brazil's Mamiraua Institute for Sustainable Development said that on average a new species was discovered every two days. But all the newly discovered animals and plants were found in areas at risk from human activity, the authors warn. More than 2,000 new species were found between 1999 and 2015. The report, published in Sao Paulo on Wednesday, is the third in a series and covers the years 2014 and 2015. The Amazon rainforest, the largest in the world, is famous for its diversity of species and habitats. Ricardo Mello, co-ordinator of the WWF Brazil Amazon programme, said the fact that researchers were still finding hundreds of species was proof that there was much more work to be done in the region. But Mr Mello warned that human activity such as farming and logging were posing a risk to the flora and fauna of the Amazon. "All the species that were discovered, all 381, are in areas where humankind is destroying the Amazon. This is very important to us, because it links the fact that our economic activities are causing species to go extinct before we even know about them," he said. The report comes at a time of heated discussion in Brazil about the use of natural reserves for mining. On Wednesday, a court suspended a government decree that would have opened up the vast Renca reserve in the eastern Amazon to commercial mining. The decree, which was backed by President Michel Temer, was described by opponents as "the biggest attack on the Amazon in the last 50 years". The government said it would appeal against the court's suspension.